Seasonal decoration helps to keep me grounded in that particular moment of my life. Yes, I suppose that sounds philosophical yogi with a strange Bravo channel twist. But what I simply want to convey is celebrating and embracing the season through home interiors, quarterly fashions, baked dishes, and even seasonal gardening helps me enjoy what life has to offer at that particular moment in time that will soon become a memory. The project I am sharing with you today is really a two part project, but I wanted to give you some time to complete and use today’s project before moving on to the second half. We had a record setting hot summer. As a result we lost every tree we planted in the spring. The other day while checking on my pumpkins I noticed a spider had used one of the dead trees as his own canvas for a bit of Halloween decorating. His work rather impressed me. I decided to photograph this intricate web and copy it for my interior decoration...since I will not be allowing this spider to decorate “inside” my home. You may use this picture or the finished project as a template if you like. 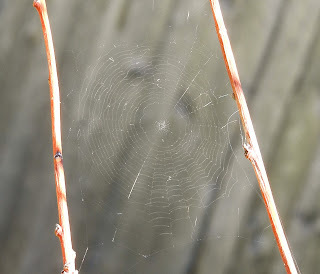 Otherwise, if you want to find a unique spider web of your own you can turn this into a fun nature project for kids. Using a thin piece of soap I wrote, “Happy Halloween” and the picture to replicate the image onto the felt. You could also use chalk. I did not use a crochet needle. I used a hand sewing needle with a large eye, but to help the bulky crochet thread through the eye I coated it with soap. You can firmly rub the thread across soap or wax to keep the fibers together and slippery enough to thread your needle. This project is for display in your home. You want it to look stylish and valuable. Choosing the cream versus a stark white helps keep it from appearing as a “craft” project. Double the thread on the lettering and the supporting web threads. Attach clothes pins and ribbons to hang it as a sign. Get creative! Find many different uses for your new work of Halloween art. And come back to see my other use for it.